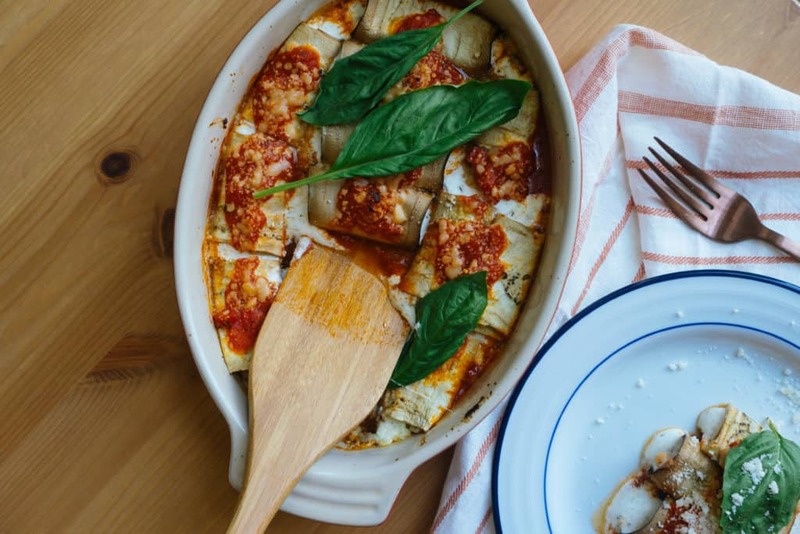 Italian is back on the menu with this delicious, low-carb Eggplant Manicotti! Matt takes it back to his Italian roots with this one, but transforms the traditionally high-carb, pasta recipe into a low-carb version using eggplant. Make this for your family tonight! Add this to Your 30-Minute Meals Rotation! We're always on the hunt for 30-minute meals because life can get hectic and we don't always have food prepped in the fridge. This recipe comes in handy when you are looking for a change-up from the boring, old keto meals and want to feed your non-keto family. It's packed with flavor and will take you less than 30 minutes, from start to finish, to make. Some other great 30 minute meals we like to add to our dinner rotation are our Keto Butter Chicken, Keto Egg Roll in a bowl, and Chicken Crust Pizza! Say Hello To Low Carb Italian Food. Italian food has a bad rap and for good reason. In America, we've tippled the portion sizes and taken traditionally simple, smaller portioned meals and turned them into high-carb, high-fat meals in restaurants. Delicious? Of course. Necessary? Absolutely not! We make that evident with this low-carb version of manicotti. It's just as delicious and filling, but simpler in its form and more true to what meals should be like. You can enjoy all the glory of Italian food again, so dig in! Pasta is one of those foods that taste delicious in the moment, but weighs heavy in the belly after it's gone. What we really love is all those Italian flavors, so why not bring back Italian food minus all the carbs? Our eggplant manicotti is the perfect way to make this happen and we guarantee your family won't even miss the carbs! NOTE: The ingredient amounts for the filling in the video are different from the ingredients amounts listed below. There was leftover filling when we made it for the video, therefore the ingredients below reflect what was truly used in the recipe. 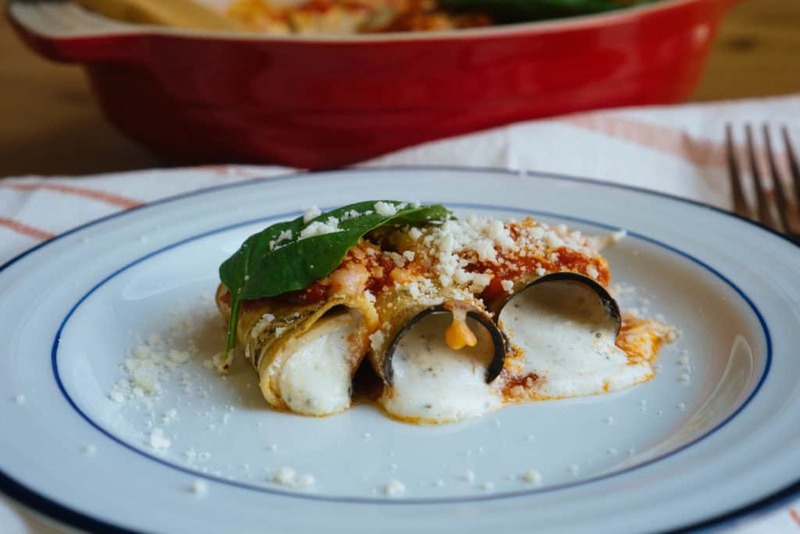 Recipe can be quickly added to MyFitnessPal - Search "KetoConnect - Eggplant Manicotti"
Combine all the filling ingredients a in a small mixing bowl and set aside. Slice the eggplant in half and use a mandoline to make thin slices of eggplant lengthwise. You want about 12-15 slices depending on how much you are making. Set aside. Layer 1/2 cup of marinara sauce in the bottom of your casserole dish (3-4 qt). Spread using a spatula. Take a slice of eggplant into your hand and spoon a dollop of the filling onto the end. Roll the eggplant and place in the casserole dish on top of the sauce. Repeat until your casserole dish is filled. We had 12 total roll ups. Top with 1/2 cup of marinara sauce and sprinkle with additional grated Parmesan (1/4 cup). Best stored in an airtight container up to 5 days. TIP: place the eggplant slices in an even layer on a cutting board and sprinkle with salt. Let sit for 5-7 minutes and then pat dry with a paper towel to remove excess moisture. This will ensure that your final product isn't too watery.